This journal bandolier was exactly what I needed to get my essential note taking tools from meeting to meeting without fuss. It has just enough slots for my preferred pens and ruler, and I decided to modify the last two to hold my flattened Bluetooth ATC mouse. 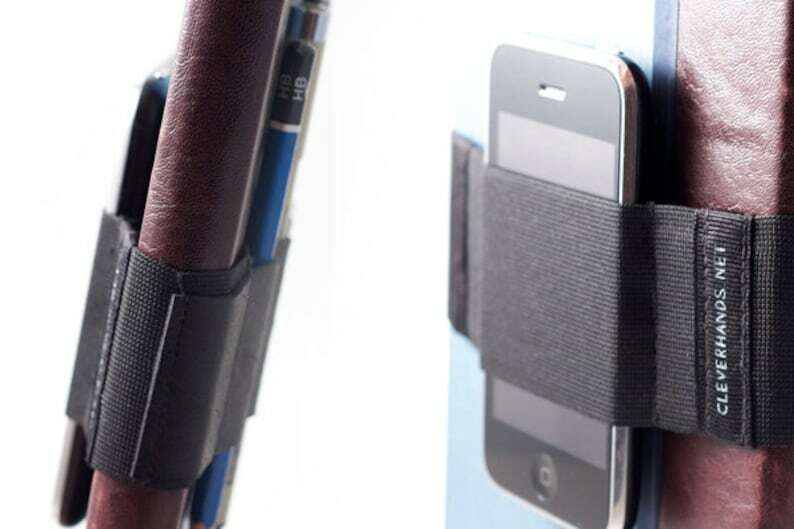 I also love the phone slot on the back when I need a single-handed carry or want to bring along a pack of Post-Its. The reclaimed rubber is sustainable, beautiful, and grippy to hold onto everything easily. The construction is immpecable and it shipped very quickly for a custom order. I can't recommend this product enough. Thank you! Really great design and finally my pens don't fall all over the floor every time I go to a meeting.